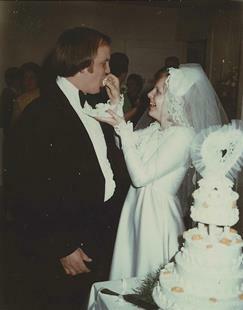 My husband and I are celebrating our thirty-ninth wedding anniversary. As we had planned a wedding, we had planned our married life. I was in college when we married but was going to graduate, teach for three years, then be a stay-at-home mom to our three children. My husband had taken a leave from college and was working when we were married but was going back to college, become an accountant, and climb the corporate ladder. We were going to build our dream house in our hometown and live happily ever after. I did graduate, and my husband did become an accountant, but the corporate ladder turned out to be a step-stool because God had another call for my husband – to the ministry. We left our hometown, and my plans, that I thought were so grounded, suddenly flew away! My three years of teaching became twenty-seven. Because of health issues, we only had one child (but he has blessed us more than any three ever could). My time of staying at home came after our son had a home of his own. The hometown dream house has become a beach dream house but is still a dream. Our plans have had ups and downs, turns and twists, but we were right about the “happily ever after”! My grandmother used to say that God laughs when we make plans, and He must have had a hardy chuckle at the two of us! As I look back over the last thirty-nine years, I am so thankful that my plans flew away and were replaced with Your plans, Lord. Your ways are so much better than mine. Thank You for the change of plans! !